We support the efforts of investigators with the material resources and expert assistance they need to develop, test and implement innovative health care solutions. Western New Yorkers are benefitting from the growth of clinical research on the Buffalo Niagara Medical Campus, all led by UB’s health sciences schools. We're preparing the next generation of clinical and translational researchers. Programs support outstanding junior faculty and senior fellows. The K12 Faculty Scholar Program in Implementation Science is helping to move biomedical discoveries the last step of the way into health care practice. A highly competitive, $15 million, four-year NIH grant is helping to jump start state-of-the-art clinical and translational research in Western New York. Using local institutional support and an award from the National Center for Advancing Translational Sciences, the CTSI funded 11 projects in the 2018-19 cycle. We bring together researchers and administrators to address topics vital to launching, sustaining and completing a successful clinical or behavioral research project. A UB professor of biochemistry and pediatrics was on Robert Guthrie's team that pioneered newborn screening programs worldwide in the '60s and '70s. 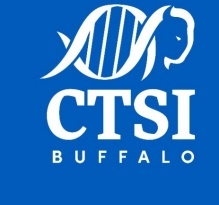 UB's CTSI brings together scientists from across the Buffalo Translational Consortium, a partnership among 20 leading health care, research and community organizations. Core Competency Workshops provide researchers and trainees with an efficient approach to developing and enhancing research skills. More information here. Since 2015, the University at Buffalo has increased by more than 30 percent the funding it receives to conduct clinical trials, while the number of Western New Yorkers participating in UB clinical research has grown by two-thirds. The vision for UB's CTSI is to improve the health of our community through the development, testing and sharing of novel approaches to health care. There are many ways members of the public can participate in research, from focus groups to patient advocacy groups to volunteering in a clinical study. Participants report feeling more satisified with their health care and can potentialy gain access to new treatments avaialble only to research volunteers. The CTSI Workforce Development Core will be awarding digital badges for the Responsible Conduct of Research and Scientific Communication core competency workshop series this spring. A digital badge is a new way of learning that allows individuals to showcase their achievements to employers, colleagues and peers. All members of the Buffalo Translational Consortium are eligible to take advantage of these free digital badging opportunities, including students, staff and faculty members. Erie Niagara Area Health Education Center (ENAHEC) and UB’s Clinical and Translational Science Institute (CTSI) will be co-hosting “Taking Action Together: A Community Conversation on Opioids” on Thursday, February 28 from 1 to 4 p.m. at the Jacobs School of Medicine and Biomedical Sciences. Improving the amount and quality of collaboration in the realm of scientific research will be the subject of an innovative workshop to be sponsored by the University at Buffalo’s Clinical and Translational Science Institute (CTSI) in February. Early registration closes on January 31. The 2018 – 2019 CTSI Seminar Series kicked off on Monday, October 29 with a presentation co-sponsored by the University at Buffalo CTSI and the School of Dental Medicine titled Iron in the Fire: The Role of Oxidized Linoleic Acid Metabolites in Pain by Kenneth Hargreaves, DDS, PhD, professor and chair in the Department of Endodontics and professor in the Department of Pharmacology, Department of Physiology and Department of Surgery at the University of Texas Health Science Center in San Antonio. Hargreaves is also a co-principal investigator of the Institute for Integration of Medicine and Science (the UT San Antonio CTSA hub). We're taking the work out of workshops by going 100% virtual, allowing access from anywhere! Great Lakes Health clinical institutions are adopting a single patient record using a common EHR – Cerner – over the next five years, which will advance data-driven clinical trials recruitment and clinical research. A September 27 workshop, hosted by UB’s Institute for Healthcare Informatics and the Clinical and Translational Science Institute, brought together investigators, practitioners, medical faculty and students, and informatics scholars from UB, Kaleida Health System and Erie County Medical Center (ECMC) to learn about the new EHR and associated systems and modules for clinical research and observational research informatics. Erin Bailey, MSM, chief financial officer, Clinical and Translational Science Institute (CTSI) was recently presented with the Distinguished Service Award by National Council of University Research Administrators (NCURA) at its Region II annual meeting. Eight-year-old Domenic Moran looked skeptical when Natalie Lamb said she was going to use rubbing alcohol to produce visible strawberry DNA. “Tricks, Treats and Science Discoveries: Free Family Fun and Learning Fair” is returning to the Buffalo Niagara Medical Campus (BNMC) on Saturday, October 27, from 1 to 4 p.m. in the University at Buffalo Jacobs School of Medicine and Biomedical Sciences. Since 2015, when the National Institutes of Health awarded UB the Clinical and Translational Science Award (CTSA), clinical trial research has significantly expanded. That expansion has brought with it a stronger emphasis on using new approaches, both high-tech and low-tech, to bring cutting-edge health care to more Western New Yorkers. A comprehensive, university-wide effort to boost clinical research at UB is paying off. Since 2015, the university has increased by more than 30 percent the funding it receives to conduct clinical trials supported by both the federal government and private industry. Scientists have made spectacular progress in understanding human disease, but the rate that new treatments are getting to patients hasn’t improved. A paper published this summer in the Journal of Clinical and Translational Science marked the culmination of a two-year collaboration between four universities that’s being called a model of multi-site, team-based translational science. The Primary Care Research Institute currently has an opening in its T32 National Research Service Award (NRSA) fellowship program. This T32 fellowship prepares primary care research (PCR) fellows (both health professional and research-related doctorates) with PCR skills, emphasizing the Triple Aim research agenda. A paper published by a team of UB researchers in the July edition of the Journal of Clinical Microbiology has been picked up by two publications targeted to health care professionals. Eduardo Salas, PhD, is an internationally recognized expert on the science of teamwork, fostering team effectiveness and the design and implementation of team training strategies. UB’s Clinical and Translational Science Institute (CTSI) Translational Pilot Studies program is now accepting Letters of Intent for 2019-20 pilot study applications. The Young Scientist Research Program is a two-week immersive summer school program conducted by the Biology Department at Canisius College for local high school students who may be considering science majors in college. A five-year, $2.5 million grant awarded last summer to the Department of Biomedical Informatics in the Jacobs School of Medicine and Biomedical Sciences is helping to train a new generation of research leaders in the analysis and interpretation of complex health care datasets. The prime point of entry for researchers seeking access to the services and resources provided by the University at Buffalo’s Clinical and Translational Science institute (CTSI) is the online Service Request Portal. On June 29, the CTSI unveiled its Service Request Portal version 2.0, which features significant upgrades on both the front end and back end. New drugs and diagnostic tests go through years of clinical trials before being approved. But while regulatory approval is an enormous hurdle, getting through that process doesn’t automatically ensure that patients have access to these medical innovations. A group of 66 undergraduate students who are participating in summer programs in the health sciences at UB came to the Clinical and Translational Research Center (CTRC) to learn all about careers in clinical and translational research from experts already working in the field. The intrepid cyclists of the CTSI Research Riders took to the streets of Western New York to raise money for Roswell Park Comprehensive Cancer Center. The team of 11 CTSI employees, friends and family members raised $4,060. The next series of Open Research Office sessions will provide principal investigators and research coordinators with an expert take on a crucial aspect of the scientific endeavor: planning and managing research budgets. New findings could alter how doctors predict whose disease will become more severe. Faculty and staff members from UB’s Clinical and Translational Science Institute (CTSI) were among those recognized at a ceremony following the annual Stockton Kimball Lecture at the Jacobs School of Medicine and Biomedical Sciences on June 6. Steven J. Fliesler, PhD, Meyer H. Riwchun Endowed Chair Professor, vice chair of ophthalmology and co-director of the CTSI Translational Pilot Studies Program, is one of four Jacobs School of Medicine and Biomedical Sciences faculty who have been appointed to the rank of SUNY Distinguished Professor. A screening of the film "The Immortal Life of Henrietta Lacks" followed by a panel discussion was meant to build trust between clinical-translational researchers and members of the surrounding community. A diverse group of clinical and behavioral investigators and research coordinators came to UB’s South Campus in April for the third Open Research Office session. Community activists, scholars, clergy and members of the public will gather April 28 at the Jacobs School of Medicine and Biomedical Sciences to discuss Buffalo's health dispartities. A trio of clinical and translational research experts spoke at the March 26 Scientific Communications Core Competency Workshop, the fifth out of six workshops in the series offered by the CTSI’s Workforce Development core. Christopher P. Austin, director of the National Institutes of Health’s (NIH) National Center for Advancing Translational Sciences (NCATS), recognizes that translational science has a problem. A renewed commitment to advancing research by UB and its partners on the Buffalo Niagara Medical Campus has led to an increase in the number of local clinical studies, giving more Western New York patients the benefit of cutting-edge treatments that have significantly improved their lives. “Enhancing Workforce Excellence and Cultural Diversity by Broadening Participation and Professional Development” will present approaches to increasing diversity and enhancing excellence in both educational programs and the translational research workforce. The University at Buffalo’s Clinical and Translational Science Institute (CTSI), with local institutional support and an award from the National Center for Advancing Translational Sciences (NCATS), National Institutes of Health, has awarded 11 new grants to support promising translational research projects in Western New York. Nikhil Satchidanand, PhD, one of the first KL2 Scholars in the University at Buffalo Clinical and Translational Science Award-linked KL2 Mentored Career Development Award (MCDA) program, has joined the faculty of the Jacobs School of Medicine and Biomedical Sciences Department of Medicine as an assistant professor, it was announced in February. This month UB’s Clinical and Translational Science Institute (CTSI) welcomed two new scholars to the ranks of the Buffalo Translational Consortium (BTC) Mentored Career Development Award (MCDA) program. Two publications in prestigious, peer-reviewed journals which explore treatments for substance use disorders were selected as winners of the Buffalo Translational Consortium 2017 Clinical Research Achievement Awards. A unique partnership between two BTC partners is closing the gap between medical research and practice. The CTSI Statistical Workshop Series, which began in September and continues through May, includes the following core competencies: statistical approaches, study design, sources of error, research questions and literature critique. The UB CTSI Workforce development core is pleased to introduce the 2018 KL2 and BTC Scholars cohort. The Workforce Development core of the UB Clinical and Translational Science Institute (CTSI) has launched four new Core Competency Workshop Series since the start of the academic year last fall. Margarita L. Dubocovich, PhD, director of the UB CTSI Workforce Development core and the program lead and principle investigator of the CTSI’s KL2 program, has been awarded the inaugural Dolores Shockley Minority Mentoring Award from the American College of Neuropsychopharmacology (ACNP). Innovation Labs are a facilitated five-day collaborative journey in planning creative and audacious new solutions. The new building allows UB to train more doctors to alleviate physician shortages, achieve breakthroughs in biomedical research and transform health care in Buffalo. If you’ve ever visited the fifth-floor atrium of the Clinical and Translational Research Center (CTRC), odds are you’ve noticed a large pine tree growing in the corner over by the north-facing windows. Innovation Labs bring together early-career scholars with experienced mentors to drive novel solutions to grand challenges in translational research. The CTSI Workforce Development Core, Community Engagement Core and the KL2 Mentored Career Development Program are pleased to announce the Clinical and Translational Research Core Competencies on Community Engagement. Starting January 25, 2018, NIH-defined clinical trial applications must be submitted using a Funding Opportunity Announcement (FOA) that is worded specifically for clinical trials. In the past, clinical trial applications could be submitted for FOAs that were not identified as being clinical-trial specific. Submitting to the wrong FOA will lead to rejection of your application. She was developing a promising treatment for PTSD among urban youth when tragedy struck. Now her research partners are working to keep her legacy alive. The CTSI Workforce Development Core and the Collaboration and Team Science Core are pleased to announce the Clinical and Translational Research Core Competencies on Translational Teamwork. The CTSI Workforce Development Core and the KL2 Mentored Career Development Program are pleased to announce a Clinical and Translational Research Core Competencies series on cultural diversity. An enthusiastic crowd of at least 175 local trick-or-treaters and their families turned out for the first-ever “Tricks, Treats and Discoveries: Family Fun and Learning Fair,” held October 28 in the Educational Opportunity Center on the Buffalo Niagara Medical Campus (BNMC). The UB Clinical Research Office announced that effective Monday, November 13, 2017, two new initiatives to facilitate and support clinical research across UB will be initiated: Central Study Registration (CSR) and Department/School Scientific Review. One of the main goals of UB’s Clinical and Translational Science Institute (CTSI) is to advance clinical and translational research that will improve the health and well-being of people living in Western New York, with a special emphasis on reducing the health disparities experienced by many in our community, including underrepresented minority groups and the poor. People who participate in clinical trials are happier with their health care and have better health outcomes. James Marks, MD, MPH, a 1973 graduate of UB’s medical school and executive vice president at the Princeton-based Robert Wood Johnson Foundation, returned home during Alumni Weekend in October to talk about the economic impact that academic medical centers can have on a city like Buffalo. An important goal of UB’s Clinical and Translational Science Institute (CTSI) is to improve the representativeness of research studies, including participants from special populations such as children, the elderly, underrepresented racial and ethnic groups, and people with disabilities. The KL2 award provides research mentoring and career and professional development to junior faculty in health science disciplines engaged in clinical and translational research. UB's Clinical Research Office started this academic year off with the rededication of the Research Roundtable newsletter. The CTSI Seminar Series resumes on October 5 with a presentation co-sponsored by the School of Dental Medicine. The UB CTSI Workforce Development Core is ratcheting up its offering of Core Competencies in Clinical and Translational Research seminars. Jessie J. Polanco, recipient of a 2016 diversity supplement from UB’s Clinical and Translational Science Award (CTSA), was co-first author of a study published August 8 in Stem Cell Reports. The Fall Seminar Series at the University at Buffalo Research Institute on Addictions will feature national experts on heavy drinking in young adults, dating violence, financing addiction treatment and tobacco use. Timothy F. Murphy, MD, authored a blog post on the American Federation of Teachers website about how Washington’s anti-science sentiment will hurt research funding for NIH. A new five-year $2.5 million grant to the Department of Biomedical Informatics will train a new cadre of research leaders skilled in analyzing and interpreting big data. On July 15, Umesh Sharma, MD, PhD, a CTSI Scholar in the Mentored Career Development Program, was granted a five-year, $986,850 KO8 award. The 2017 CTSI Seminar Series, which brings top experts in their respective fields to the University at Buffalo for speaking engagements, returns in October following a summer hiatus. Steven J. Fliesler, PhD, has been elected to a leadership post in the Association for Research in Vision and Ophthalmology (ARVO). Undergraduate students participating in summer programs in the health sciences at UB were invited to explore careers in clinical and translational research on June 23. On a beautiful Saturday morning in June, the CTSI Research Riders put their collective pedal power to work for cancer research and treatment at Roswell Park Cancer Institute. Roll-out of the university-wide OnCore research management system continues to make progress one year after its first introduction to the UB research community. An article in Health about a report from the Los Angeles coroner’s office that found that actress Carrie Fisher had multiple drugs in her system when she died after suffering a heart attack in December. The story features an extensive interview with Kenneth Leonard, who is the director of UB’s Research Institute on Addictions and a CTSI board member. Ellen Volpe, PhD, RN, FNP-BC, assistant professor and researcher in the School of Nursing, died June 8 in a car accident on the Thruway. She was 45. UB’s ongoing efforts to recruit underrepresented students in science, technology, engineering and mathematics (STEM) to its PhD programs have received a major boost from the National Institutes of Health, which renewed a five-year, $2.3 million grant to help fully fund scholarships. BUFFALO, N.Y. – Rina Das Eiden, PhD, senior research scientist in the University at Buffalo’s Research Institute on Addictions, and a Buffalo Translational Consortium partner, has been named chair of the Psychosocial Development, Risk and Prevention Study Section in the National Institute of Health’s Center for Scientific Review. Like conventional pacemakers, tiny new leadless pacemakers are designed to work for about 12 years. L. Nelson “Nick” Hopkins is a pioneer in the use of catheters — long, flexible tubes — inserted into the vascular system in the groin and threaded to the brain to treat strokes. The procedure, once called “crazy” by the medical establishment, is now the preferred method in many situations. Margarita L. Dubocovich, PhD, SUNY Distinguished Professor of pharmacology and toxicology has been awarded the UB President’s Medal, which recognizes “truly extraordinary effort on behalf the university and the communities we serve,” according to University at Buffalo President Satish K. Tripathi, PhD. A National Institutes of Health (NIH) training grant aimed at providing professional development resources and mentoring for doctoral students in several UB schools has been renewed for another five years. The University at Buffalo Clinical and Translational Science Institute (CTSI) held its 2nd Annual Forum on March 28. CTSI well-represented at annual ACTS Translational Science conference in D.C.
More than 20 UB faculty and staff members were on hand to represent the Clinical and Translational Science Institute (CTSI) at the Translational Science 2017 conference held in Washington, D.C., April 19-21.